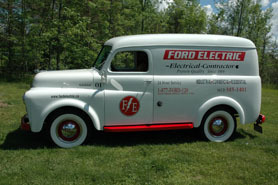 The concept of the Panel Truck Restoration was to restore a vintage Panel Truck to display all the innovations that electrical work has taken since Charlie Ford first opened his doors in 1919. 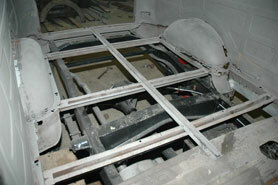 We have displayed pics on how the restoration has taken place, Please drop us a line and tell us what you think. 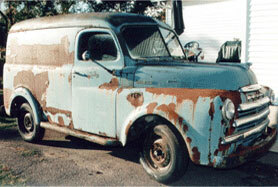 this 1950 Dodge Panel Truck. 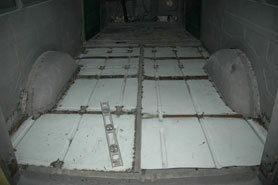 front end of the Panel Truck. 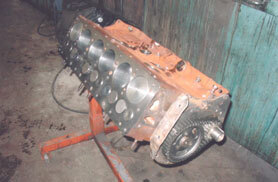 After the drivetrain was removed. 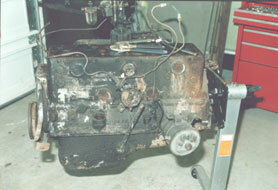 We now have turned our attention to the engine compartment and have started to dismantle the 218 flat head six cylinder engine. After cleaning 55 years of dirt and grease from the engine we can see what we are working with. It took a bit of searching but we found the engine parts we needed. 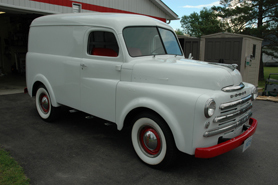 It turns out that our panel truck was originally a military speced vehicle with a rare engine size/bore and stroke. 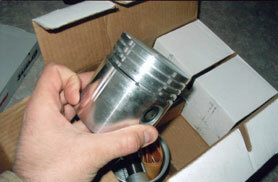 We found these replacement pistons in Texas. 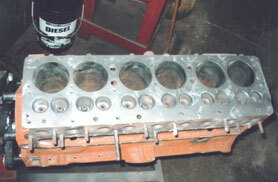 Here we are putting this engine back together with new pistons, valve seats, valves, timing chain, crank and cam. 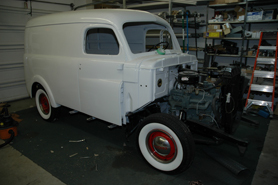 After a few coats of paint on the engine block we lowered it onto the now black frame and began re-installing all the engine components including the re-built carburator. Here is one of the guys (Joel) working on the rear brakes. We were able to order all our brake parts from our local Auto Parts Extra store and they also helped us get our brake shoes, clutch and pressure plate re-lined. 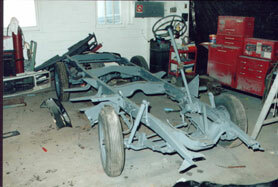 This shot shows us getting the main body sandblasted. It certainly is going to need a good body man to bring this beast back to life. 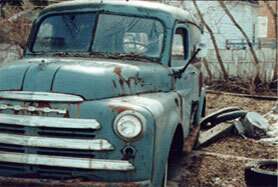 This picture shows a 1948 Dodge Truck donor vehicle that we managed to find in California. 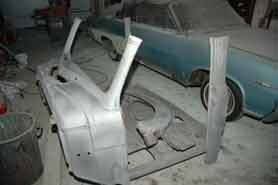 Not only will its front fender, hood and grill become part of our project but it's main body as well. 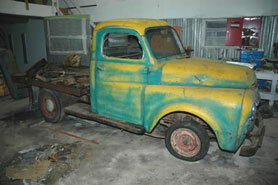 This picture shows the '48 truck cab that is going to become part of our '50 panel project. 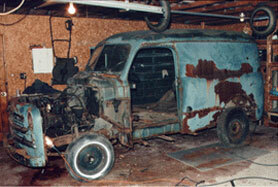 Here is the panel truck body ready for it's front end transplant. 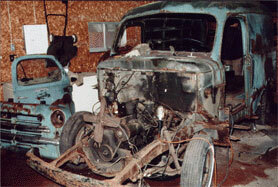 Here you can see that the panel truck and pick-up truck have become one. A lot of body work ahead of us. Here we can see how far gone the back floor was when we started. 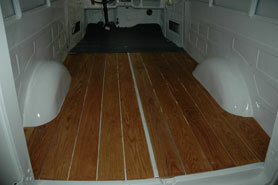 Before adding the oak flooring in the back of the panel, we decided to reinforce it with a steel floor. Here we see the oak flooring after it's first coat of stain. What a difference from a few months ago! Once the front end went on, the truck really started to come together. 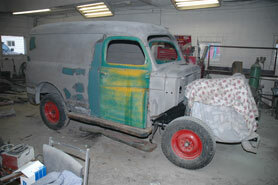 Here is our 1950 Dodge Panel truck finally near completion. Eight years in the making we managed to rebuild this vehicle using only funds collected by the recycling of materials from job sites.